Background: Recently, it is suggested that the use of olive leaf polyphenols like oleuropein (OLP), hydroxytyrosol (HT), and others could decrease breast cancer cells viability significantly. Also it has been shown that it inhibits cell proliferation, induces cell apoptosis, reduces cell viability, and significantly stops cell cycle in growth 1 phase (G1) demonstrated via increasing the Michigan Cancer Foundation-7 (MCF-7) cells in the G0/G1 phase. Objectives: We aimed to study whether the use of olive leaf extract affects breast tumor size and the activity of antioxidant enzymes. Materials and Methods: Four groups of female BALB/c, each containing five mice were studied. Three days after tumor transplantation, the first group received distilled water. The second, third, and fourth groups were treated with 75, 150, and 225 mg/kg/day of olive leaf extract (OLE) for 3 weeks, respectively. To assess anti-cancer and antioxidant effect of OLE, volume and weight of tumor, and also antioxidant enzyme activity were measured. Results: Treatment with 150 and 225 mg/kg/day of OLE reduced the tumor volume and weight (P < 0.05) compared to the first group significantly. It also increased the CAT activity (P < 0.05) in the third group and increased the activity of superoxide dismutase in the third (P < 0.05) and fourth groups (P < 0.005) resulted in excitotoxic tolerance in the treatment groups. Conclusions: Consumption of OLE after tumor transplantation reduced the tumor growth. On the other hand, owing to its highly-packed polyphenols, catalase and superoxide dismutase activities in tumor tissue were increased. The most common cause of death in the world among women is breast cancer. Epidemiological studies have shown that many diseases including atherosclerosis, cardiovascular diseases, and various cancers such as breast cancer have a lower incidence in Mediterranean regions compared to the European countries (1-3). The main reason for this phenomenon could be a diet rich in vegetables, and less meat consumption. Actually, more than 75% of all common anticancer drugs, used in clinics, are either of natural origins or inspired from nature to some extent. A number of international research groups, according to an observation, are trying to discover molecular mechanisms activated or blocked by natural compounds. Sometimes these components are provocatively believed to be excellent sources for future preventive medications and natural anticancer drugs able to aim at the main signs of cancers or their disabling features (4, 5). Normally, a small amount of active oxygen (ROS), super dioxide anions, hydrogen peroxide, and hydroxyl radicals are produced in anaerobic organisms. In many cases these materials at low levels play a crucial role in intracellular signals, apoptosis, immune system, and in the immune defense against microorganisms (6). But when oxidative stress (imbalance of ROS production and its inhibition by antioxidants) (7) happens, it damages macromolecules (8, 9) and leads to different kinds of disease. In addition to electron-transport chain of mitochondria which produces extra ROS in vivo, there are different oxidizing factors. They cause DNA damage of various kinds such as depyrimidination, depurination, breaks in single- or double-stranded DNA, changes in base and sugar, and finally crosslinks between DNA and protein (10, 11). In addition to DNA repairers, which are responsible for the surveillance of the genome and cell cycle checkpoint control systems, antioxidant enzymes including superoxide dismutase (SOD), glutathione peroxidase (GPx), and glutathione-S-transferase (GST) as well as phase two detoxification play important roles in cell cycle defense (12). SOD and catalase (CAT) are antioxidant enzymes protecting the cell from oxidative stress. SOD family is found in cytosol, mitochondria, and extracellular matrix. The first two contain copper/zinc (Cu/Zn) and manganese (Mn), respectively. Through a sequence of redox reactions, SOD breaks peroxide anions down (8). Many reports have been released to declare the necessity of these enzymes to protect the living being. Imperfection of SOD is experimentally related to several types of cancer (13). It is shown that SOD suppresses tumor growth in breast and prostate cancers (14). It was also seen that SOD was abolished in patients with brain tumor (15). Although cytosolic SOD deficiency did not disturbed the normal growth, it shortened lifespan. In this case, oxidative stress raised the chance of tumor appearance (13). TEMPOL or 4-Hydroxy-TEMPO, a SOD-like substance, exhibits a wide range of actions in diseases related to oxidative stress (16). It was shown that SOD has various effects to inhibit the process of cancer. First, since H2O2 is one of the reasons of apoptosis, increase in the amount of H2O2 by the activity of SOD increases the apoptosis. (17). Second, this enzyme stops tumor growth by neutralizing superoxide anion (18). Catalase is the other powerful enzyme. This enzyme by a molecular weight of 240 kDa is a tetramer and has four subunits, each 60 kDa. The main responsibility of this enzyme is to defend against hydrogen peroxide, which is regularly produced in cells during metabolism. This toxic agent is usually detoxified by CAT. CAT changes H2O2 and alters it into water and oxygen (6). Reduction of CAT activity because of lung inflammation increases the intracellular hydrogen peroxide. These events induce cancer by damaging DNA (19). Liver CAT activity is 22% lower in patients with cancer (20). Also, presence of oxidative stress in patients with breast cancer is seen because of low activity of CAT and high formation of oxygen free radicals (21). This evidence proves the importance of this enzyme in cell protecting mechanisms. Many studies have illustrated an association between CAT and other antioxidant enzymes and their protective effects against cancer (22, 23). One of the critical roles of antioxidants in body health is prevention of lipids peroxidation and therefore, inhibiting their production. This substance binds to DNA, RNA, and proteins in a covalent way; so damages DNA and also inhibits proteins such as NA1/K1 ATPase and glutamate transporter (6). 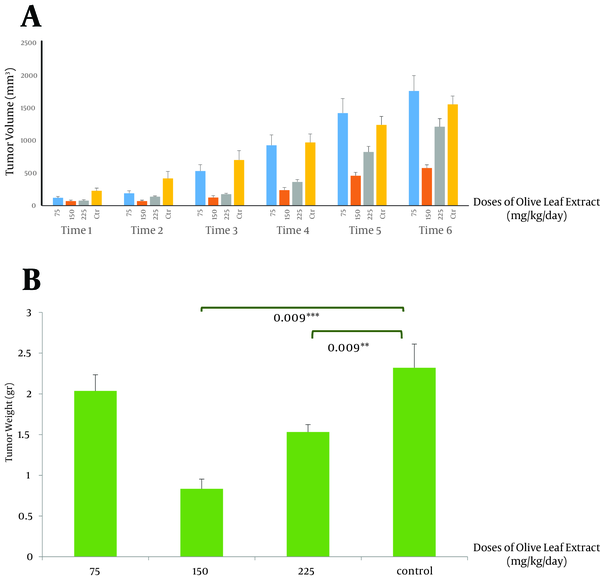 The most important phenolic compounds in olive leaf extract (OLE) are oleuropein and hydroxytyrosol (24), but the predominant composition is oleuropein, concentrated in OLE much more than olive oil (24, 25). This material has shown antioxidant effects on skin by scavenging free radicals. It reduces cyclooxygenase-2 (COX2), which in turn inhibits the expression of vascular endothelial growth factor (VEGF), matrix metalloproteinase (MMP) 2, 9, and 13. By doing so, carcinogenesis and tumor growth is lowered. In addition, anti-inflammatory, anti-viral, anti-microbial, and neuroprotective properties of the extract have been seen (24). In olive oil, polyphenol compounds cause a rapid inhibition of P38 and cyclic adenosine monophosphate response element-binding protein (CREPB) phosphorylation, which decreases COX2 expression. The growth and proliferation of adenocarcinoma cells of human gut were reduced by increasing the blockage of transition from G2 to M in the cell cycle (26). In our research, we looked into the effects of consumption of OLE on breast tumor volumes and weight. We also examined if the activities of antioxidant enzymes such as superoxide dismutase and catalase were modified due to our experiment regarding the fact that their activity was considered important in increased levels of protection against a wide variety of diseases. The suppressing effects of polyphenols on different cancers, and the miraculous effects of olive polyphenols in Mediterranean diet, and on the other hand, the occurrence of breast cancer at younger ages in Iranian women with its high death rate, led us to studying the effects of olive leaf polyphenols on breast cancer. To evaluate the probable effects of olive leaf polyphenols on breast tumor growth and its antioxidant properties. All experiments were executed after the approval of Shahid Beheshti University Ethics Committee in Iran. In addition, our study was experimental. Twenty female inbred BALB/c mice weighting 16 to 18 grams and aged 5 to 7 weeks were purchased from the Pasteur Institute, Karaj, Iran. They were randomly divided into four groups. Throughout the study they were provided with water and standard mouse food ad libitum. All mice were kept in a 12:12 hours of dark-light cycle at 25°C in the same animal facility under the same condition. In this study, mice were divided into four groups and received the dietary intervention (10 am - 12 pm) every day for 3 weeks by gastric gavage. Three days after the tumor transplantation, the first group, control group, received distilled water. The second, third, and fourth groups were treated with 75, 150, and 225 mg/kg/day of OLE for 3 weeks, respectively. Razi Herbal Medicines Research Center, Lorestan University of Medical Sciences, prepared OLE from Olea europaea (variety: sevillano). We dissolved OLE powder in distilled water before use. The phenolic amount of this composition was shown previously (27). The 14% oleuropein in our extract is the difference of our method from the mentioned protocol. Since 4T1 cell is a good metastasis model with weak angiogenesis, we induced the tumor via subcutaneous tumor implantation. An invasive ductal carcinoma, a spontaneous mouse mammary tumor (SMMT), which grows in female BALB/c spontaneously (28), was separated from a cancer-bearing female BALB/c, with scalpel cut into small pieces less than 0.5 cm3, and was transplanted subcutaneously to the syngeneic female BALB/c mice. After about a week, when the tumor appeared, tumor size was measure two times a week with digital caliper, and total volume was evaluated by the following formula (29): V = LW 2/2, where V is the volume, L is the length, and W is the width. After 3 weeks of treatment with OLE as the therapeutic agent, mice were sacrificed, tumors were separated and weighed. Then for further investigation, they were transferred and kept in a -80°C freezer. For measuring the activity of SOD, we followed a previously published procedure (30). We added 0.003 g of pyrogallol and 0.0018 g ethylenediaminetetraacetic acid (EDTA) to 50 mL of sodium phosphate buffer. The absorbance of the blank buffer which was SOD buffer, including all ingredients except the homogenate sample tissue, was evaluated by spectrophotometer at 420 nm for 4 minutes at 25°C. The change in absorbance of each sample was monitored in the same condition. The difference between the blank and the sample absorbance indicated change in enzyme activity. To evaluate the activity of catalase, we used a previously practiced technique (30). We made the catalase buffer by adding 0.05 mL H2O2 to 50 mL of sodium phosphate buffer. The changes in the absorbance of the blank, buffer without sample supernatant, and samples were monitored by spectrophotometer at 240 nm for 2 minutes at 25°C. Information on tumor volume was analyzed with factorial ANOVA, and weight data and the level of enzyme activity were analyzed using one-way ANOVA. The least significant difference (LSD) was used as the post-hoc test, and statistical significance was considered as P < 0.05. This study showed that therapeutic use of OLE reduced the tumor volume from 852.2 ± 2 mm3 in the control group compared to 0.834 ± 24.07 mm3 (P < 0.005) and 464.56 ± 39 mm3 (P < 0.005) in groups receiving OLE with doses of 150 and 225 mg/kg/day, respectively. The final weight of the tumor also decreased meaningfully from 2.032 ± 0.3 g in the control group to 0.834 ± 0.11 g (P < 0.005) and 1.5 ± 0.09 g (P < 0.05), in the treated group, with doses of 150 and 225 mg/kg/day of OLE, respectively (Figures 1 A and B). Data analysis of the activities of catalase showed significant increase in the group treated with OLE with the dose of 150 mg/kg/day (P < 0.05) (Figure 2 A). No changes in catalase activity were observed with higher doses. Increase in SOD activity was shown in the third and fourth groups (P < 0.05 and P < 0.005, respectively) (Figure 2 B). No significant change was observed in the tumor weight, volume, and enzymatic activity with the dose of 75 mg/kg/day. According to the recent studies polyphenol compounds have anticancer properties. In some investigations, an association has been found between diet and gastric cancer. It was shown that consumption of polyphenols such as cinnamic acid, secoisolariciresinol, and coumestrol in large amounts, reduced the risk of gastric cancer. In contrast, the use of animal products rich in nitrate and nitrite increased the risk of gastric cancer significantly. These results were also reported for intestinal cancer (31). It was shown that vitamin E is an antioxidant, a substance which reduces oxidative stress and inflammation and induces apoptosis of cancer cells (32). Similarly, components of green tea polyphenols had antioxidant effects increasing apoptosis of cells and inhibition of proliferation (33). Other studies performed on the effects of polyphenols in grape seed oil implicated their defensive properties against breast cancer and beneficial effects on human health. This research suggested that phenolic compounds found in grape seed would reduce the tumor volume and weight of breast cancer compared to the control group. In addition, in vitro inhibitory effect of phenolic compounds on the proliferation was seen, and induced apoptosis in breast cancer cells was clarified (34). Another study was performed to explore the effects of grape seeds on antioxidant activities in rats. Catalase activity inclined to be higher by feeding the animals with grape seeds. These results suggested that diets supplemented with grape seeds were beneficial to suppress lipid peroxidation in high fat-fed rats (35). In pomegranate as well, polyphenols were potent antioxidants, both in vitro and in vivo, to inhibit the growth of prostate cancer and some other types (36, 37). Consumption of OLE induced ischemic tolerance in rats, which could be due to lipids level changes, but more studies are needed (38). It also reduced neural deficiencies such as brain edema and deficit of blood-brain barrier (27). Using olive leaf polyphenols for 12 weeks significantly improved insulin sensitivity and pancreatic β-cell secretory capability in overweight middle-aged men at risk of developing metabolic syndrome (39). Anticancer effects of the extract are also notable. Some findings proposed that OLE exhibits anti-proliferative effects on leukemic cells by inducing apoptosis (40). It was also shown that the extract inhibited cell proliferation, induced cell apoptosis, reduced cell viability, and significantly stopped the cell cycle in G1 as shown by raise in MCF-7 cell which was in the G0/G1 phase (25). Hydroxytyrosol, another main component of OLE, significantly and dose-dependently reduced intracellular ROS levels and DNA damage in MCF10A cells (41). Olive oil was reported to affect enzyme activity, too. Daily intake of extra virgin olive oil increased CAT in erythrocytes significantly (42). This study demonstrated that consumption of OLE, probably due to its polyphenol compounds, decreased mammary cancer growth, and volume and weight of the tumor just like previous studies. Also, we proposed that treatment with this polyphenol-rich composition increased the antioxidant enzyme activity including CAT and SOD. Because antioxidant enzymes such as CAT and SOD protect cells from damage by scavenging free radicals of oxygen, if they increase owing to the consumption of polyphenols such as OLE, they would reduce damage to macromolecules and cause resistance to cancer. In our findings, with doses of 150 and 225 mg/kg/day, the tumor volume and weight were significantly decreased. With the dose of 150 mg/kg/day, both SOD and CAT showed significant increase in their activities, while with the dose of 225 mg/kg/day there was an increase in SOD activity. The likely explanation could be that with higher doses, the extract has other inhibitory effects, but more studies are needed to clarify that. The probable mechanism of inhibited tumor growth could be the fact that olive leaf polyphenols block cell cycle in G1/S through reducing COX2 and cyclin D1 expression, which ends in blocked tumor cell growth and proliferation. Besides, by increasing the SOD activity, H2O2 is elevated, which in turn damages DNA and increases the apoptosis. Regarding the fact that ROS has a key role in cell signaling, antioxidant enzymes can exercise protective effects by reducing ROS. So it is possible that enzyme activity affects defense capabilities against cancer, but further studies are needed to show its precise mechanism. 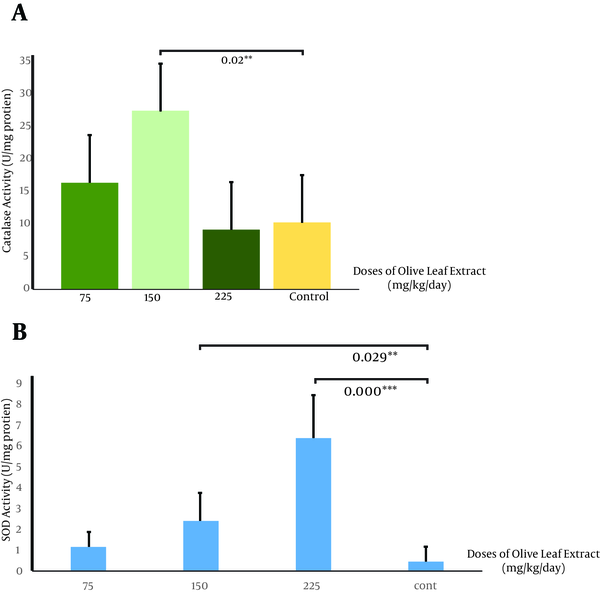 Both doses of 150 and 225 mg/kg/day of olive leaf extract reduced the tumor volume and weight (* P < 0.05, n = 5). However, 75 mg/kg/day of the extract caused no significant changes. It seems that the medium dose of olive leaf extract ended in differences that are more significant. Our data showed a significant increase in catalase activity with a dose of 150 mg/kg/day, while other doses showed no significant effects (A). We also recorded a significant increase in superoxide dismutase activity with doses of 150 and 225 mg/kg/day, but a dose of 75 mg/kg/day caused no changes (B) (* P < 0.05, n = 4). This paper was a part of the master thesis of Sarah Milanizadeh at Shahid Beheshti University. Hereby, we truly appreciate the executive supports of all professors who sincerely helped us to conduct this study. Implication for health policy/practice/research/medical education: Taking olive leaf extract as a nutritional supplement could be useful to inhibit tumor growth. Authors’ Contribution: All the experimental procedures, data analysis, and manuscript preparation were performed by Sarah Milanizadeh, supervised by Dr. Mohammad Reza Bigdeli, Dr. Davar Amani, and and Dr. Bahram Rasoulian. Dr. Bigdeli approved the final draft. Financial Disclosure: Dr. Bigdeli reported receiving research grants from Shahid Beheshti University from the Ministry of Science, Research and Technology. Funding/Support: This study was supported by the grant of Shahid Beheshti University, Razi Herbal Medicines Research Center, Lorestan University of Medical Sciences.